The history of the astrolabe begins more than two thousand years ago, but it is in the Islamic classical world that the astrolabe was highly developed and its uses widely multiplied. Introduced to Europe from Islamic Spain in the early 12th century, it was one of the major astronomical instruments until the modern times. In this concise and beautifully illustrated article, Emily Winterburn casts a short story of the Islamic art of making astrolabes – developing the different varieties, the description of their structure and parts and their uses in social, religious and scientific functions. Figure 1: Emily Winterburn. (Source). This article has been kindly written for Muslim Heritage by Emily Winterburn in 2005. We are very grateful for the article and in particular for the permission to use the images it contains. Formerly at the National Maritime Museum in Greenwich, Emily Winterburn was at the Centre for the History of Science, Technology and Medicine, Imperial College, London at that time. Emily Winterburn comes from a background in physics and the history of science. As the Curator of Astronomy at the Royal Observatory, Greenwich, she was responsible for one of the world's most important astronomy collections. Emily Winterburn has written for the BBC and Astronomy Now magazine and has appeared on the BBC's "What the Ancients Did for Us", Channel 4 News, and "In Our Time" with Melvyn Bragg. She is the author of The Astronomers Royal Winterburn (National Maritime Museum, 2005) and The Stargazer's Guide: How to Read our Night Sky (Constable, 2008). Al Sufi, one of the most famous astronomers of the Islamic world, was writing in Isfahan (in modern day Iran) in the 10th century. In his writings, he outlined over 1000 uses of an astrolabe. Accounts of the astrolabe as a scientific instrument range from the very earliest given by the Greek astronomer Hipparchus in around 150 BCE, through writings from the Islamic world, to modern day descriptions by historians and curators. All emphasise that the astrolabe is an extremely versatile instrument. The fundamental operation of astrolabes has varied little in their long history. All use the relationship between the apparent movement of the stars, as seen from a particular latitude on Earth, and time - allowing them to be used to find the time from the stars or Sun, and the position of the stars and Sun at a particular time (a feature particularly useful when casting horoscopes). All similarly have the flexibility to be used as both an observational instrument and as an aid to mathematical calculation. The astrolabe is thought to have originated in Ancient Greece. Though no examples have survived, Hipparchus, writing in around 150 BCE, is credited with discovering ‘stereographic projection', the mathematical means of representing the 3D sky onto a 2D plate that is the basis of how the astrolabe works. While the origin of the astrolabe may have been Greek, it is generally agreed that the design was then perfected in the Islamic world – indeed the name Astrolabe comes from the Arabic version of the Greek term ‘Star holder'. The earliest surviving physical example of an astrolabe belongs to a private collection on permanent loan to the Kuwait National Museum and has been travelling the world in a touring exhibition called ‘Islamic Art and Patronage, Treasures from Kuwait' since the Gulf War (1991). The astrolabe in question was made in Iraq and signed and dated Nastalus, 315 H (927-928 CE). – the alidade or rule with sights used for making observations and reading off scales. The rete and plates are designed to fit into the mater. The figure 4 shows the mater from the back, surrounded by 4 plates, the alidade, the rete and the pin and horse that hold the assembled parts together. The figure 5 shows the rete of an astrolabe engraved in Latin. On this you can see a circle marking the ecliptic with each zodiac sign labelled (Virgo, Libra, Scorpio, etc.) and pointers for key stars which are easily visible with the naked eye such as Rigel and Altair. The back (fig. 6) is then decorated with a varying number and range of tables, the most common being a calendar scale allowing the user to match the Julian / Gregorian calendar date with the position of the Sun in the zodiac. Also common to almost all astrolabes is the shadow square for calculating the height of buildings using basic trigonometry. To make an observation with an astrolabe, you need to hold it with the ring at the top to ensure it hangs down straight. If observing the Sun, you then hold it out and line up the rule so that the Sun's beam travels through both sights onto a point on the ground. This is because you must not look directly at the Sun. The degree scale around the edge of the back of the mater will give you the altitude or angular height of the Sun above the horizon. If observing a star you hold it up and look though both sights up at the star and again read off the angle where the rule crosses the degree scale. If observing the height of a building you need first to measure your position from the base of the building, then look through both sights at the top of the building, then read off the shadow square the ratio of vertical to horizontal distance given by where the rule crosses on the shadow square. Figure 7: Measuring the height of a building with an astrolabe. Figure 8: Parts of the astrolabe. One of the most common calculations that can be made with an astrolabe is to find the time using the Sun or stars. – This is done by first selecting the plate appropriate to your latitude. Each plate is engraved with concentric circles marking out degrees of altitude from 0 at the horizon to 90 at the zenith (or the point directly above the observer). – Next, observe the star to find its altitude (see above). – You then find that star on the rete. – rotate the rete until the pointer for that star lines up with its altitude on the plate. – Finally, attach the rule to the front of the astrolabe and then rotate the rule until it lines up with the star at its correct altitude. – The time can then be read from the scale around the rim of the mater. The process is very much the same when finding the time from the altitude of the Sun, except that you need to add in an extra stage. Using the calendar scale on the back, find the position of the Sun in the ecliptic (i.e. the corresponding part of the sign of the zodiac for that date). This part of the ecliptic on the rete then acts in place of a star pointer, and as before is lined up with the correct altitude on the plate beneath. To make predictions about when the Sun will appear in a particular part of the sky as seen from a particular latitude on a particular date, the process needed is roughly the reverse of that described above. – First you need to find the position of the Sun in the ecliptic for that date using the calendar scales on the back of the astrolabe. – Next you need to rotate the rete to line up that part of the ecliptic on the rete with the horizon on the plate for your latitude. For sunrise, use the horizon line to the left (east) of the centre, for sunset use the horizon line to the right (west). – Then as before, rotate the rule until it lines up with the ecliptic at the horizon and read off the time on the hour scale around the rim of the mater. To cast a horoscope, it is necessary to know the position of the stars visible in the sky at the time of birth. – finding the position of the Sun in the ecliptic for the date of the birth in question and select the correct plate for the latitude of the birth. – Then, rotate the rule until it lines up with the time of birth. – Next, rotate the rete until the part of the ecliptic relating to the correct date rule. This setup of the astrolabe then shows all the stars visible in the sky. All the stars shown on the rete above the horizon were visible at the time of birth, all those on the horizon were just rising or just setting, and all those below it were not visible at that time. In addition to this feature, many astrolabes also have tables engraved on the back displaying other astrological information that might be useful in the casting of horoscopes. These include tables of triplicities (showing which zodiac signs are Fire, Earth, Water or Air), the zodiac subdivided into limits (5 unequal divisions of each sign), decans (3 equal divisions of each sign) and faces (2 polarities – positive and negative – for the rulers for each decan) and information about the planets ruling each sign. There is also sometimes information on the lunar mansions, a feature of astrology thought to have originated in India that subdivides the zodiac into 28 (instead of 12) sections, each referring to the position of the Moon in the zodiac for a particular day. Similarly, some astrolabes have the 12 astrological houses marked out on the latitude plates since it is through these that the stars move over the course of 24 hours. Additional features unique to Islamic astrolabes (and not featured in all of those) are those tables designed to aid the carrying out of the 5 pillars of Islam. Of the 5 pillars, the two most dependant on astronomical observation and calculation are finding the qibla or direction of Mecca and predicting prayer times, and for these many Islamic astrolabes carry special tables. One quarter of the back of some astrolabes have a grid made up of concentric quarter circles (or arcs of sine) each representing the date or zodiac sign in which the Sun would be found at that date. Cutting through these are lines running from the centre of the circle to the edge; these represent particular cities. To use this to find the direction of Mecca (the qibla) from one of these cities, move the rule to the point at which the city line crosses the date line for today's date. This gives the altitude (on the outer degree scale) of the Sun at the point in that day when it is in the direction of Mecca. This method uses the fact that the Sun changes altitude and azimuth (travelling from East to West) as it crosses the sky. Figure 9: Astrolabe for determining the Qibla. Often as an alternative to the qibla, many astrolabes contain a gazetteer or table listing place names, their latitude and longitude and the direction from that point to Mecca roughly (for example NW) and more exactly. Gazetteers are often found today in booklets alongside a compass allowing prayer mats to be properly aligned. Some astrolabes also have prayer lines engraved on the plates, since these are related to the position of the Sun in the sky and are therefore latitude dependent. One final indication we find on many Islamic astrolabes, which gives them a religious dimension as opposed to simply being Arabic but non-religious, is the inscriptions. On many Islamic astrolabes we find passages from the Quran, dedications, religious verses and of course the date given according to the Hijra calendar. On this astrolabe (fig. 12) for example we find engraved along the rim of the mater an invocation to the Prophet, his mother, Fatima and the 12 Imams of Twelver Shi'ism telling us not only that it is an Islamic astrolabe, but that it was made by and / or for followers of the Shi'ite Islam. God! There is no god but He, the Living, the Self-subsisting, Eternal. No slumber can seize Him, nor sleep. His are all things in the heavens and on Earth. Who is there can intercede in His presence except as He permitteth? He knoweth what (appeareth to His creatures as) before or after or behind them. Nor shall they compass aught of His knowledge except as Hewilleth. His Throne doth extend over the heavens and the Earth, and He feeleth no fatigue in guarding and preserving them. For He is the Most High, the Supreme (in glory). Astrolabes have never been solely scientific instruments; they have always been objects of beauty as much as of function. As such, their appearance can often tell us not only how they were used but also where, when and for whom they were made. This astrolabe (fig. 14) for example was made for a muezzin in 13th-century Syria and as such is simple in its design since it was made for someone for whom function would have been more important than appearance. This one (fig. 15), on the other hand, reflects the prosperous and cultured time and place in which it was made. Made during the reign of the Safavid dynasty in Iran in the 18th century, it is like the art and architecture of that time and place, beautifully made with as much attention paid to its aesthetic perfection as to its scientific accuracy. Finally, this astrolabe (fig. 16) suggests by its appearance that it was made in a particular region. The throne (top part of the mater which links the disc part of the astrolabe with the ring by which it is suspended) is of a design typical of Lahore of this period. Indeed, the maker's signature and date engraved on the astrolabe confirms this. 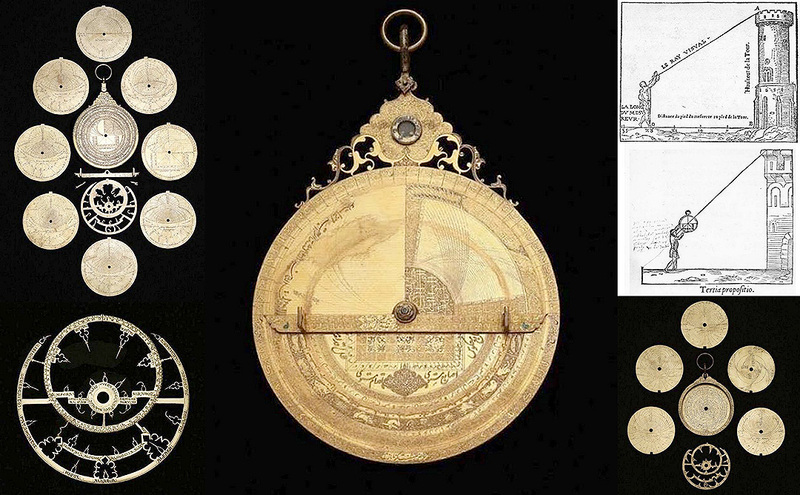 The astrolabe was introduced into the Christian West around the 13th century CE via Islamic Spain. Europeans adopted the astrolabe along with the various astronomical texts – some translations of Greek originals, some purely Arabic – and it had become widespread within learned circles by the 14th century. For a while, the astrolabe came to symbolise the astronomer in the West just as much as it had in the East, with numerous treatises dedicated to its versatility, including Geoffrey Chaucer's English account of the astrolabe, the first to be written in the West in a language other than Latin, written for his 10 year old son. In the 1400s, a variation on the standard design was developed by the Portuguese and a new instrument, the mariner's astrolabe, was created. This, unlike the astronomical astrolabe, was a purely observational device with no scope for calculation. The astrolabe fell out of fashion as a scientific tool in the West in the 17th century, as a whole range of other instruments catering to specific needs – the telescope for observation being the most significant – that had previously been carried out by the astrolabe were developed. As a collectors' item, the astrolabe was rediscovered in the West in the mid-19th century, and today examples can be found of astrolabes from around the world in museums. Included in those collections are a number of fakes made in the 19th century, made in response to their newfound popularity among non-scientific collectors. In the East, however, the compactness of the astrolabe allowing so many functions to be performed by just one handy and portable instrument continued to be valued until well into the 19th century. Today, in many parts of the Islamic world, the astrolabe is still seen as a symbol of scientific and cultural excellence and its image features in company logos, formal gardens and even shopping centres. Figures 19: Painting of the Istanbul Observatory. It shows workers at the observatory of Taqi al-Din at Istanbul in 985 H (1577). Two observers are working with an astrolabe. A universal astrolabe of the saphea form is on the table in front of the man with the dividers and paper. The painting is from Shahinshah-nama (History of the King of Kings), an epic poem by 'Ala ad-Din Mansur-Shirazi, written in honour of Sultan Murad III (reigned 1574-95 [AH 982-1003]). (Source).